The facebooks told us to pop in on day one, so we did – expecting nothing, and expecting everything, all at once. Roasters may thank us for lowering expectations by publishing this post. Spoiler alert: what’s moved North is only the bean-making machines and the outdoors queueing. What’s stayed south is the panini paraphernalia and the whole Roasters Dining Experience. North, you’ll get a park, a muffin and a (locally designed) paper cup. South, you’ll get a seat, a sandwich, and some atmosphere. North, we cross Lonsdale to place The Order. About half a dozen others are doing the same. The Waitress / The Barista is radiating stress, and makes us tread water at the new window. When granted permission to speak, we place The Order, which we capriciously make Soy, a cappucino (The Long). We settle back to admire The Decor – exposed brick (how now), custom-made stools, and ye olde chalkboards. Inside, we spy bags of beans in lines, but whether we’re allowed to enter is unclear. People seem happy to order and hang around outside – The Wait is impressively unawkward, and not too long, considering. The Long, when it arrives, hasn’t lost that loving feeling. 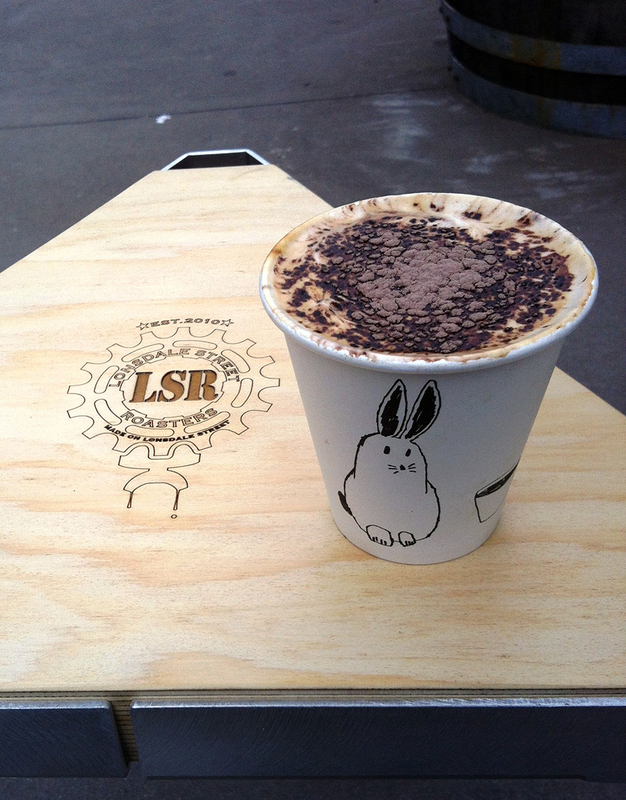 It’s a courageous capp – a big choc dump and plenty of foam. Through the bambooey bite of cafe soy, we can still taste that Roasters burnt caramel coffs. We resolve to be back at The New Roasters, when the fresh resin-paint smell has worn off, and summer slash the cyclists have settled in. 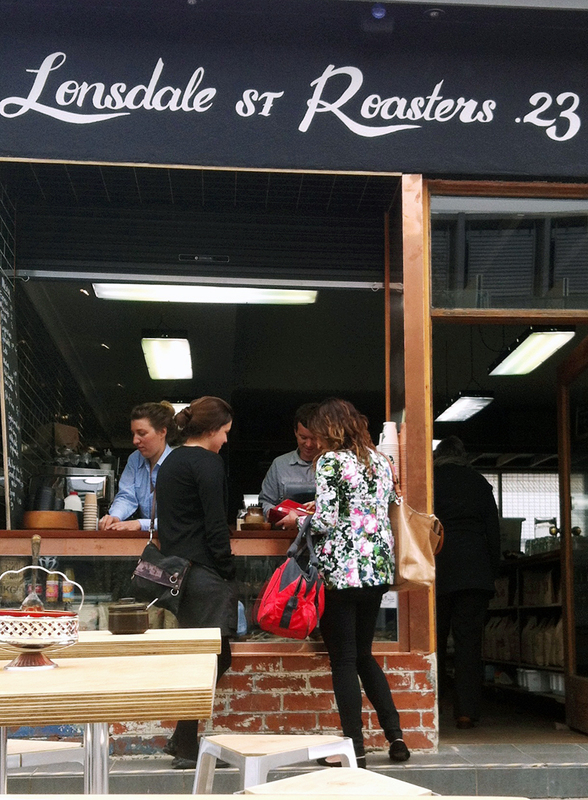 Driving past The Old Roasters, we spy (with our little eyes) a full house of dine-ins, and scattered takeaway waiters. 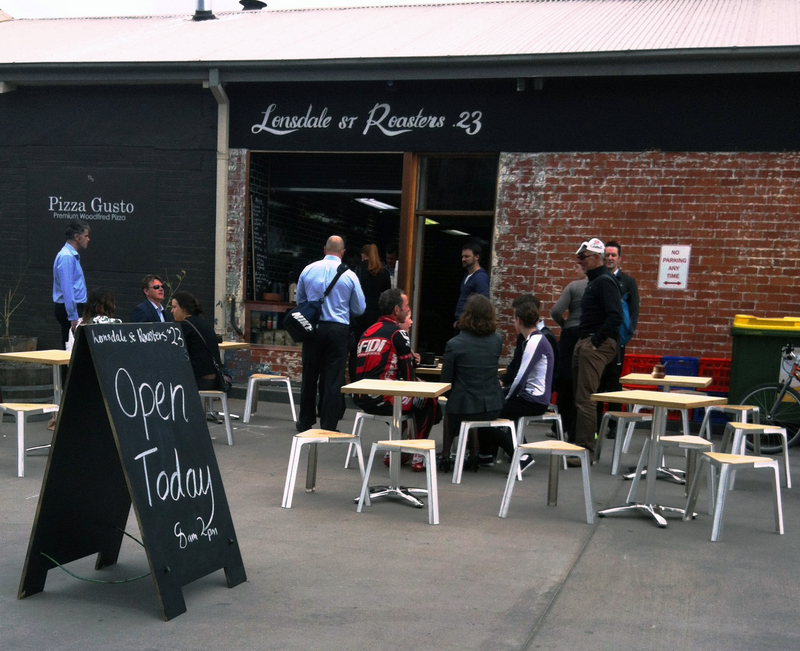 The Latte Word: Lonsdale is central to two ‘scenes’ – the ‘great outdoors’ and ‘cycling’ . It offers some serious services – post office, car wash, Medicare and petrol, and it’s soon to be home hundreds of clean-living well-earning apartment-dwellers. While it may not be Marketing 101 to duplicate your business a stone’s throw from the original, the exception to the rule could be a brand as grounded in geography as Lonsdale St Roasters. The Newbie has weird hours (from 8, Monday to Friday – we’ll see how that goes), but it’s fair for a fuss-free drive-by. The original LSR site will either be near or in a new development. LSC has changed it’s name to the Cyclery in readiness of the move out.